Much has influenced the development of the English saddles. From the classical riding styles of the Spanish Riding School to the English and Irish sport of jumping and steeple chases to the European military styles of riding to the show ring, these saddles have evolved from a history of privilege and also the battlefield. Their design was and is based on balance of the rider and comfort of the animal. Whether on the polo field, in the heat of battle or in the show ring, these saddles needed to fit correctly as to not interfere with the performance of the horse or to sore him so he could not work again the next day. In addition, simply because we have chosen to refer to these types of saddles as English does not mean they were used or developed exclusively by the English. In fact, Italians, Germans, Poles, French and Russians have used this type of saddle for centuries in pursuit of jumping, racing, dressage, polo and showing. The forward seat, which is what most saddles you find today will be considered, was developed by an Italian in the late 1800's. Amid much controversy over the years, this forward seat eventually replaced the older classical style saddles. These saddles seem small and slight in comparison to the heavier western saddles of the New World vaquero and cowboys. Yet, they are designed and built to withstand great stress during sport, war and the rigors of classical training. They should be made of the highest quality in materials including leather, metal and wood. Riding this style of tack affords the rider close contact with the mule and a chance really to concentrate on the aids. English riding teaches the rider balance and finesse. Many equestrians feel this riding style enhances skills and puts the rider in better contact with his mount. The ultimate picture of elegance in equestrian circles seems to be that of an English rider. Mules are now showing themselves to be competitive in English events traditionally dominated by horses. You might be considering having your mule go English to enhance its versatility. The most important piece of tack that you will be considering, of course, will be the English saddle. Here are some basic guidelines to help when you go into the tack store. Just like western saddles come in specific designs for specific purposes, so do English saddles. You=ll want to know what you intend to do with your mule and what your mule is suited for. If you are competing, you will also want to check the rules under which you are showing for their requirements in their English classes. The other major characteristic which defines an English saddle is that it has panels: these are a pair of pads attached to the underside of the seat and filled with wool, foam, or air. Thus the English saddle contains its own padding and, if correctly fitted, does not require the use of a separate saddle blanket to protect the horse's back as does the Western saddle.Although some modern saddlers have developed alternative models, the English saddle is usually constructed on a framework known as a tree. The tree is made of wood, spring steel, or composite, and it supports the rider on a sling of webbing between the firm pommel (front of the saddle) and cantle (back of the saddle). On either side of the tree, a steel hook known as the "stirrup bar" is affixed. It is upon this hook that the rider hangs the stirrup leather, which is a very strong leather or nylon loop supporting the stirrup. At the bottom of the tree are several more very strong leather or nylon straps known as billets, to which will eventually buckle the girth--the beltlike strap which holds the saddle onto the horse. The tree and its various parts are upholstered with a covering made of leather, nylon or microfiber and shaped to form the seat above and the panels below. The Park or Saddle-Seat saddle has a low, flat seat which places the rider toward the rear of the horse, as is traditional in their show ring. English saddles are made in many places around the world, although many people feel that the very best quality are indeed made in Walsall, England. Other countries that produce fine English saddles are Germany, Switzerland and the United States. Argentina produces a large number of saddles, particularly for the polo market, and some have found their quality to be quite good. Modern English saddles fall into roughly four categories. Each category is adapted to the use to which the saddle will be expected to hold up and help the rider=s position. In other words, what sport will you be competing in? In choosing the right saddle for your particular discipline, it is important to understand how the combination of tree features, seat depth, saddle flap shapes and panels for each of the basic types of English saddles can help or hinder you. 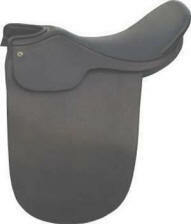 or Close Contact saddles are designed for hunter/jumper classes. With its flatter seat and lower cantle, it allows the rider to get well out of the seat in the two point position to clear fences. Stirrup bars are position more forward in order for the rider to keep his knees in correct position as he raises in the saddle with shorter stirrups. This rider has more bend in his knee and more forward position as the mule takes the jumps. The panels and knee rolls are thin and the rider has very close contact with the mule. They make this saddle specifically for jumping and competition. It has a more sloping head to allow for a more forward cut panel and flap to accommodate a more forward knee because of shorter stirrups. The jumping saddle is also built on a narrow twist (the narrowest part of the saddle and the area in which most of the rider=s weight is borne). Because of its flat seat and narrow weight bearing surface, it is not a comfortable saddle for either mule or rider for trail riding or long periods in the saddle. All-Purpose saddles, often called Event saddles, are designed with a deeper seat and stirrups farther back for a longer leg position. The head has about a 45 degree sloped. The panel is cut wider than the close contact saddle to allow the rider to use a longer stirrup leather for work on the flat or to raise the stirrup for jumping and still have the leg positioned on the flap. The deeper seat, the wider knee rolls and the often found suede covering on the flaps add to the security of this saddle. This saddle is comfortable and meets the needs of trail riding, cross country and jumping. This saddle is perfectly suitable for Hunter Under Saddle, Hunter Hack, Working Hunter and Jumping classes in mule shows. It is also suitable for the lower levels of dressage. Different types may have a construction more suitable for dressage than hunt or vice versa. 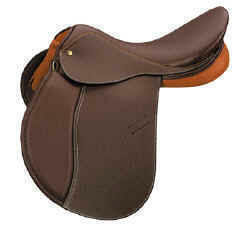 This is a good choice for your first English saddle. Dressage saddles are designed with straighter flaps and stirrup bars positioned farther back to obtain the lengthened and correct leg position. They have a vertical or only slight sloping head. With a deeper seat than the close contact, the dressage saddle holds you securely in one position - the correct dressage position with the rider more upright on the seat bones. Stuffing is generally kept to minimum for closer contact. This saddle is not designed to allow the rider movement that close contact and all purpose saddles do. Extra padding under the billet provides better weight distribution over the mule's back. The billets on the dressage saddle are considerably longer than the other saddles to prevent the buckles from interfering with the rider's legs. are carried, the center of gravity of a gaited mule is farther back. The cut back saddle allows the rider to shift his weight farther back on the mule and is set back 2-3 inches to the rear of the all purpose saddle. Panels have minimum padding. Long stirrups permit the riders heels to drop almost directly below his center of gravity. This is a saddle of maximum contact. There are deeper seat versions for equitation and will help the rider who is taking lessons stay in the correct position. This is the saddle that the gaited mules will be shown in their English classes. Again, this is not a comfortable saddle for either rider or mule for long hours or riding. The saddle tree determines the ultimate shape and design of the saddle. It assigns the saddle to what discipline for which it will be best suited, what position the rider will be in and how it fits the mule. It creates the depth and breadth of the seat. They are generally made of laminated beechwood to fiberglass. Regardless of type of the type of material used, poor construction of the tree will make the saddle worthless. 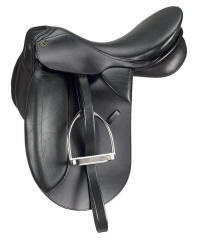 The tree, its construction and integrity are the most important factors in choosing any saddle. English saddles are built either on a rigid tree or a spring tree. Both generally are reinforced with steel for strength and durability. You will find steel plates along the head (front arch of the saddle), the gullet and the cantle. The spring tree, however, utilizes two metal strips running along the widest part of the seat. They extend from the head of the saddle to the rear of the tree directly under the rider=s seat. This allows some give to the saddle and increases the rider=s comfort, allows closer and more direct contact through the seat bones and, very importantly, is more comfortable for the mule. Spring trees tend to be deep seats placing the rider in an upright position. A rigid tree does not allow this movement. It is constructed with either a straight head for normal use or with a cut back head for use in saddle seat saddles. They are also used for wider back breeds such as Arabians, Morgans and some mules with similar conformation. Rigid trees are the base for flatter seats, but they tend to allow the rider to easily fall out of balance. Most mules and horses require a standard tree. However, some breeds may require a wide tree. Of course, just like the western saddles, you can get the tree custom made to your mule and then have the saddle built to suit your riding discipline and comfort. However, if that is not in your plans or budget, at least take your mule to the tack shop and try on the various saddles and trees available. Mules are as individual to fit as horses. Riders require different sizes based on the tree length. The average size adult woman rider usually requires a 17-inch saddle. 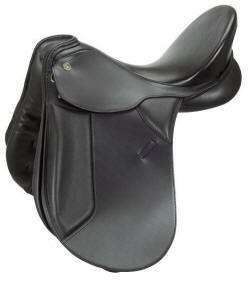 To determine if a hunt seat saddle fits you, sit in the deepest part of the saddle where you would normally ride. If you can reach behind you and place your hand palm down and have just enough room to fit your hand between your seat and the end of the cantle, it fits. Both the spring and rigid trees are fitted with webbing and padded. Panels come in two varieties - stuffed and formed. 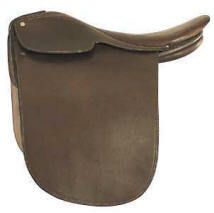 Stuffed panels are generally found in American and European saddles. 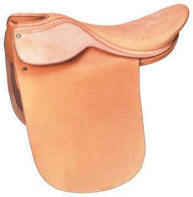 Many English made saddles, however, may come with formed panels. Formed panels will not change shape over time and wear. They either fit the horse or don't . Consequently, it might be wise to choose a hand stuffed panel for hard to fit mules. However, keep in mind that stuffed panels have problems of their own. In the hand stuffed panels felt, foam rubber, wool or leather are materials used for padding which can then be enclosed in leather or serge. This hand stuffing requires great accuracy. Whether natural or synthetic materials are used, the panels should be stuffed so that the weight bearing is evenly flocked and level on both sides of the channel. A lumpy, uneven stuffing can cause pressure points and sore the mule=s back. It can throw the tree and rider out of balance. Too much padding can restrict the contact with the back and too little can cause bruising of the mule=s back. Since these panels are stuffed by hand, there could be a discrepancy in the balance and symmetry of these panels as compared with the formed. In addition, although the stuffing may mold exactly to your mule=s back, over time and wear the stuffing material can be come uneven and lumpy. If this happens, they can be re stuffed. The stuffing is enclosed in leather and it is recommended that pigskin be kept for the softer areas of the seat of the saddle. Pigskin is not a particularly strong leather and, while soft and supple, would not be used in this area that you would want to be long wearing. Various types of leather can be used for the saddle seat from pigskin to doeskin to calfskin. Suede is also used for its sticking power, but can smooth out after use over several years. The leather used for the seat is an individual preference for the rider. Bars are made from either forged or cast steel. They are usually stamped either Aforged@ or Acast@ according to the method of manufacture. The forged are the strongest and the safest of two types. Most of them still have the archaic Asafety catch@ at the end. These catches were used on older saddles to keep the stirrup leather from slipping off the bar. Today, however, the saddle construction has improved so much that rarely happens in the better made saddles. Consequently, it is recommended NOT to engage this catch as it can be more dangerous than not in the Asafety@ position. Some of the newer saddles have what is called an Aadjustable@ bar which allows the movement of the stirrup bar to accommodate different desired leg positions. Since leg position is so critical in dressage, many of these saddles have this feature. One of the best, less cumbersome adjustable bar is the Wellep, a simple device which allows five positions of the stirrup. 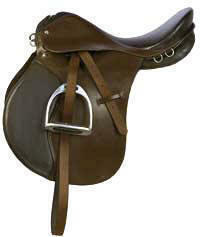 The fittings are usually not included in the purchase of an English saddle. They are sold Aless fittings@. They are extra and subject to the whims, likes and dislikes of the riders. Never underestimate the need for quality stirrup leathers. Don=t make the mistake investing a substantial amount in the saddle and then fail to pay as close attention to the quality of your stirrup leathers. Stirrup leathers need to be substantial, good quality leather. They generally come in three types of leather - oxhide, rawhide or buffalo hide. They are also made in synthetic materials today like nylon webbing, plastic and others. Real leathers come with a smooth side and rough side. In oxhide and rawhide, the flesh side (rough side) is made to face outwards so the grain side receives the friction from the stirrup bar and the stirrup itself. With the buffalo hide, the reverse is true. It is important to make sure the stitching around the buckle is heavy and triple and that the buckle is stainless. They range from 7/8 to 1 1/8 inches wide. Usually the standard 54" leathers will be appropriate for most riders. All leathers will stretch with time and most riders have the habit of putting more weight in one stirrup than the other causing one stirrup leather to stretch more than the other. So it is a good idea to switch leathers periodically to compensate. Quality leathers have evenly punched holes and will be numbered for your convenience in getting them even on each side. Stirrup irons should be made of stainless steel. Anything else is a waste of money. English stirrups come in two types - regular and offset. The regular style has the eye center so that when resting on a flat surface, the stirrup lies perfectly symmetrical. This is the most popular and comes in a variety of weights, shapes and sizes. 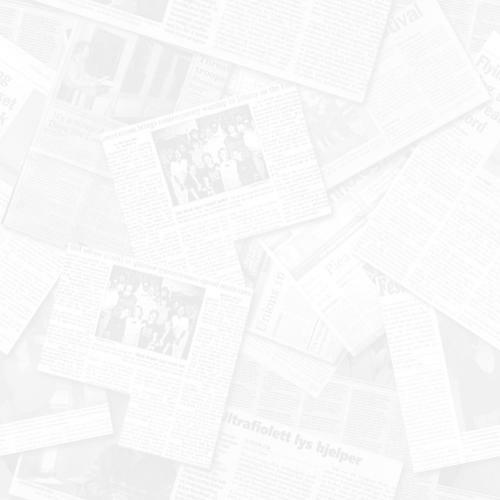 The offset style has the eye offset so that it leans more in one direction than the other. These offset irons are keyed to right or left since it is the tile that encourages the rider to keep the ankles cocked, heels down and weight on the inside ball of the foot. The offset is acceptable in Huntseat, but not in dressage. When choosing your irons, make sure the eye width will accommodate the width of leather you have chosen. Stirrup pads also come in a variety of materials for better grip. They range from rough textured metal to sand paper type finishes on rubber. The rubber pads are most popular now and actually keep the toes warmer in colder weather. In choosing irons keep in mind the weight of the iron. The heavier the iron, the easier it is to find and recover if lost. Also keep in mind that too narrow a stirrup can cause the boot to hang up and too wide a stirrup makes it easy to loose. Girths range from leather to cotton to synthetics, some fitted with foam centers. Again, preference is a matter of choice and may change from one discipline to another to one mule to another. Important in choosing a girth, is the comfort of the mule. The girth should be absorbent, soft and formed to reduce the possibility of chaffing. It should be broad enough, however, to distribute pressure and not bind. For some mules who are straighter shoulders, larger bellied with high croups, galling problems occur. For these types of conformation, make an effort to find the narrower Balding and Atherstone pattern girths. In addition, buckle protectors can be purchased.